By the 1920s, Muhlenberg’s campus was bursting at the seams. The buildings comprised the Administration Building (Ettinger), Berks Hall dormitory (East), the President’s residence (Gabriel House), the science laboratory (Services Complex), the Dining Commons (Walson), the Treasurer’s residence (Berheim House), and the Allentown Preparatory School (Brown). President John A. W. Haas (1904-1936), the Board of Trustees, and the Lutheran Church authorities envisioned “A Greater Muhlenberg,” and they commissioned architect Dr. Warren P. Laird, Dean of the School of Fine Arts at the University of Pennsylvania, to conduct a needs assessment and draw up a plan for growth. The most pressing needs were deemed to be a library, a sciences building, and a gymnasium. 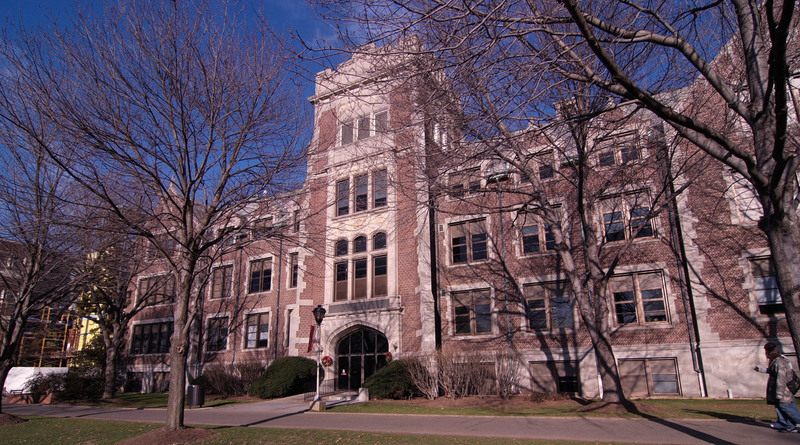 The Science Building and the Library were prioritized; the gymnasium as planned in the 1920s never came to be, and it was not until the 1950s that the College had its own athletics building (Memorial Hall). 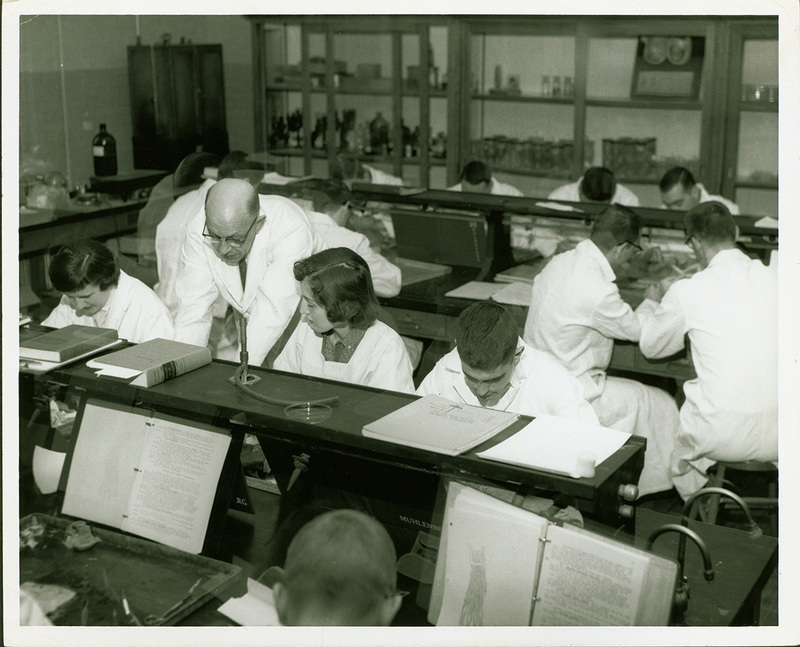 In April 1923, the College launched a million-dollar fundraising campaign to bring these dreams to fruition. The road to a “Greater Muhlenberg” over the next decade was not smooth; funds were constantly running short, and the debts incurred often left the College’s future in jeopardy. 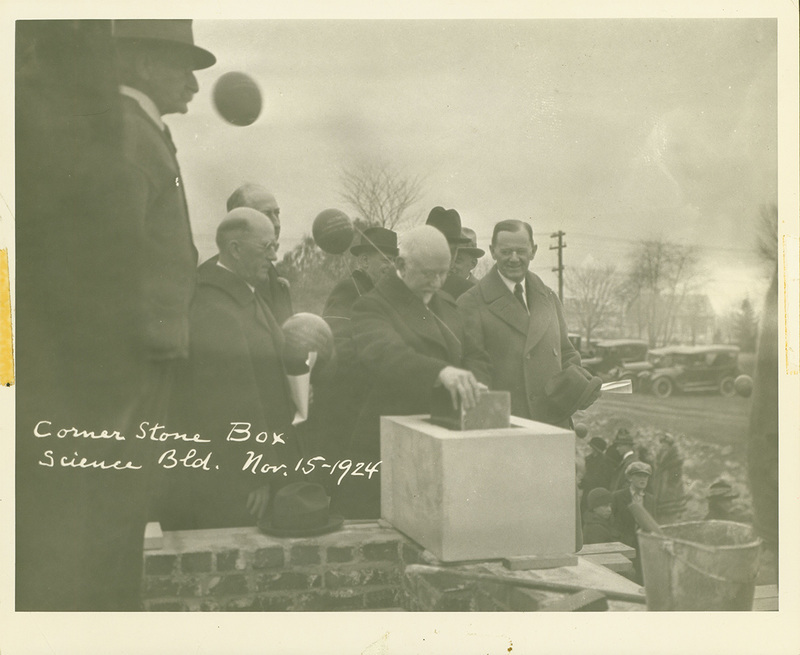 The first of the new buildings was to be the Science Building: the cornerstone-laying ceremony for what is now the Peter S. Trumbower Science Building was held of November 15, 1924. As with the earlier buildings on campus, the structure was designed by architects Ruhe and Lange of Allentown. The materials include brick from the Lehigh Brick Company; the sills and lintels are of Romberger cast stone. 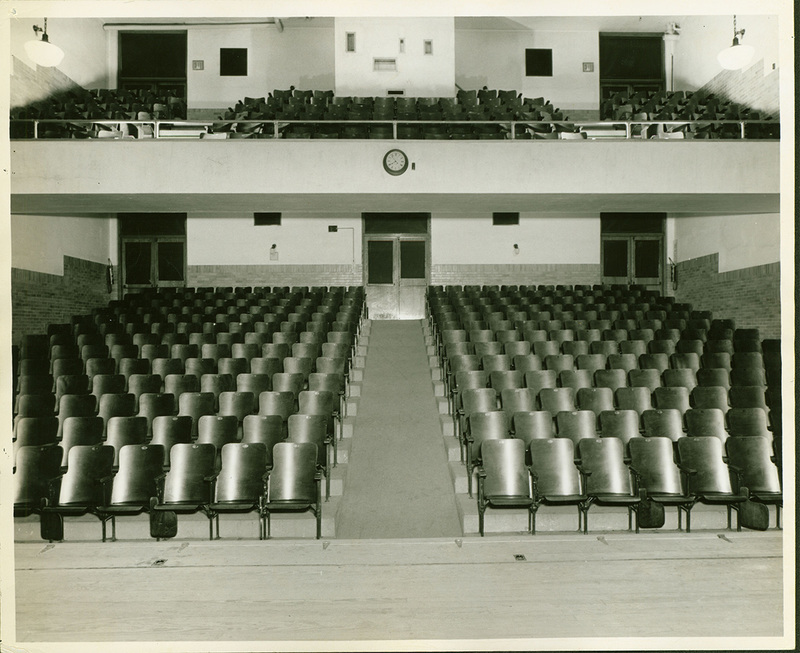 One of the most pressing needs of the College had been for an auditorium, and on June 7, 1926, the first commencement ever held on the Chew Street campus was held in the auditorium in the incomplete Science Building. 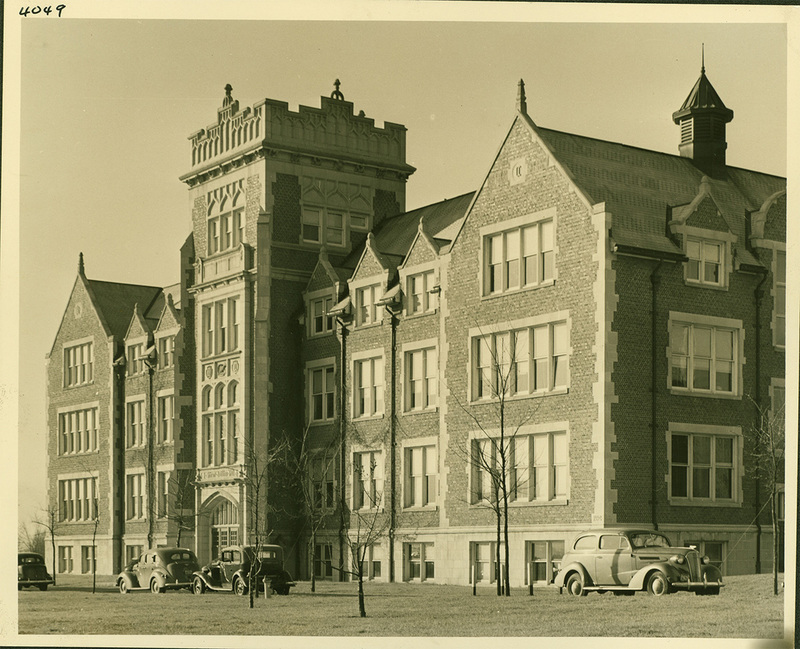 The building was formally dedicated on College Day, October 8, 1926. Renowned chemist Edgar Fahs Smith, who served as Muhlenberg’s first chemistry professor from 1881-83, spoke at both the cornerstone laying and dedication ceremonies. 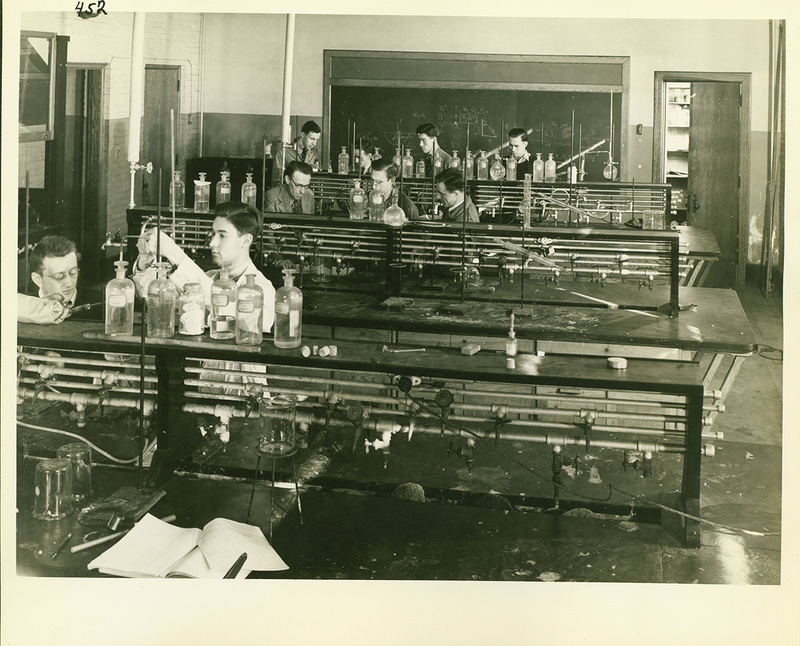 The long-awaited science facilities allowed previously constricted departments and collections to expand. 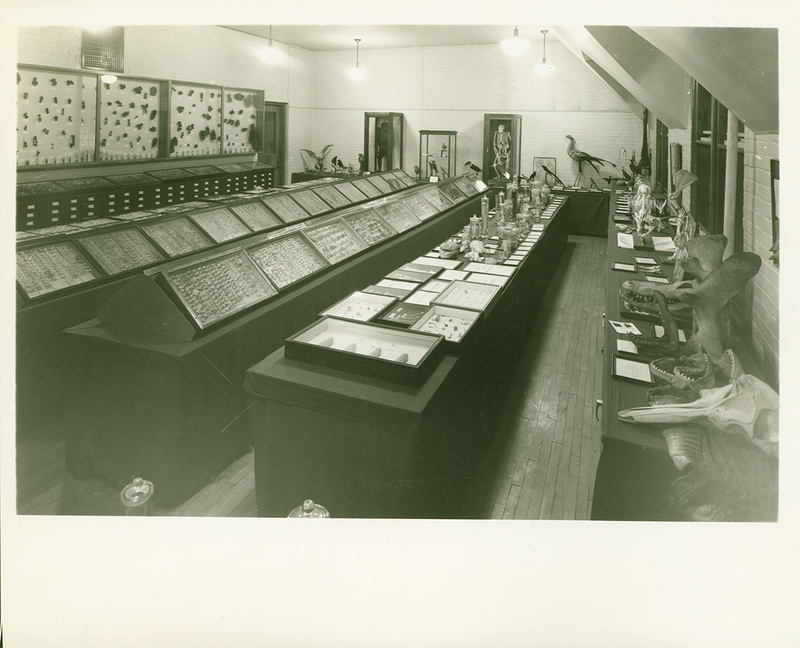 The third floor housed the Biology Department: two classrooms, two large laboratories, “a museum, a botanic room, an observing room, a vivarium room, a photographic room, and their own private office.” The Chemistry Department was located in the basement, first, and second floors of the west wing of the building, and the Physics Department in the basement and first floor of the east wing. Peter S. Trumbower, Class of 1899, was a local industrialist who served on the Board of Trustees’ Executive Committee for many years. He was awarded an honorary Doctor of Laws from the College in 1942, two years before his death. In his will, Mr. Trumbower bequeathed half of his estate to Muhlenberg; at the time of Mrs. Trumbower’s death in 1965, that amount totaled $1.1 million, the largest gift the College had ever received until that point. In 1971, the Board of Trustees moved to rename the newly-renovated Science Building; the dedication of the Peter S. Trumbower Science Building was held on October 22, 1971. 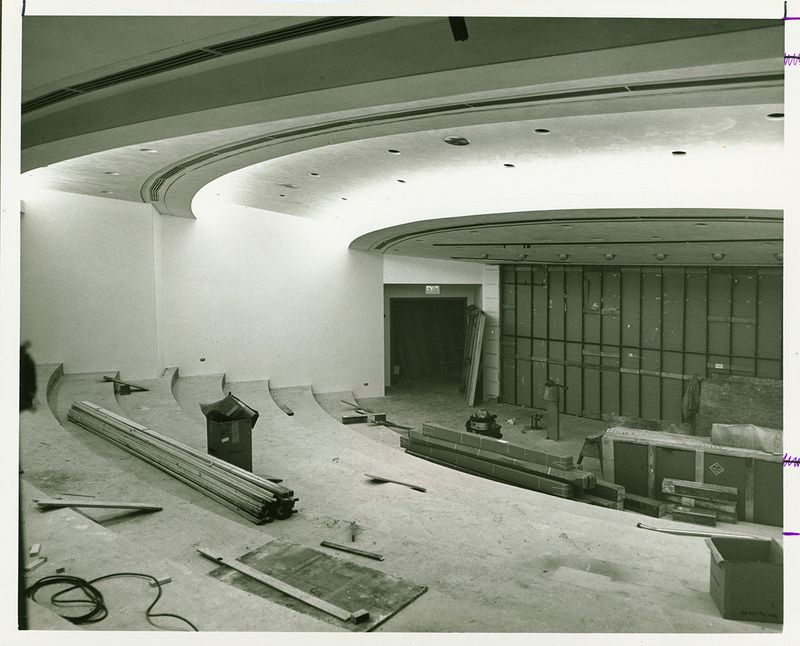 The building renovation was part of a concerted effort to modernize and invigorate Muhlenberg’s science facilities, including the construction of the Shankweiler Biology Building. The Trumbower Building today houses the Departments of Chemistry, Physics, and Mathematics. It is also the home of the Lithgow Science Auditorium. 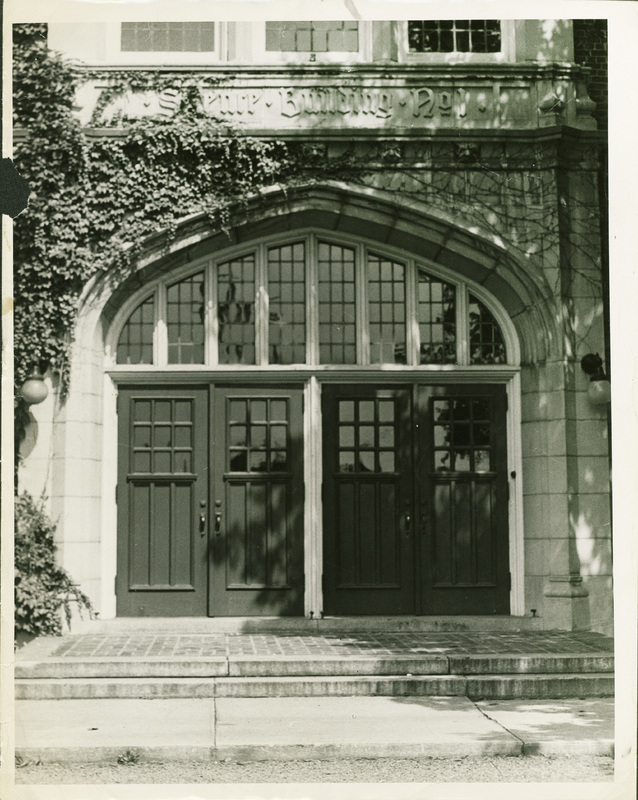 Special Collections and Archives, Trexler Library, Muhlenberg College, “Peter S. Trumbower Science Building (1926),” Muhlenberg Pathways to Present, accessed April 23, 2019, http://pathways.trexlerworks.muhlenberg.edu/items/show/15.